Another Friday, another granola bar product line review. And still, no real winners. I keep trying! I had hope for Nature Valley. Many years ago, I discovered their Sweet & Salty Nut Bars, specifically, the peanut variety. They are basic granola bars, loaded up with plentiful peanuts, and coated in this amazing salty, peanut buttery dip. Such intense peanut flavor, perfect mix of sweet and salty, and really, really good if you let them get a bit warm, so they are soft, and the peanut butter topping gets all melty. Such fond memories of these delicious treats! 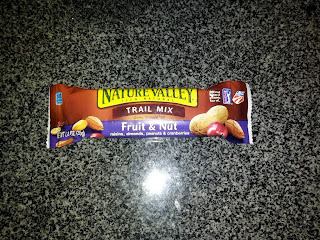 This time around, I decided to branch out and explore the rest of Nature Valley's product line. They make all the styles of granola bars that you would expect: standard crunchy or chewy, protein enhanced, trendy greek yogurt covered, diet style thin crisps, and even breakfast biscuits. None of the varieties I tried this time around even remotely live up to those magic sweet and salty nut bars of my memories though. 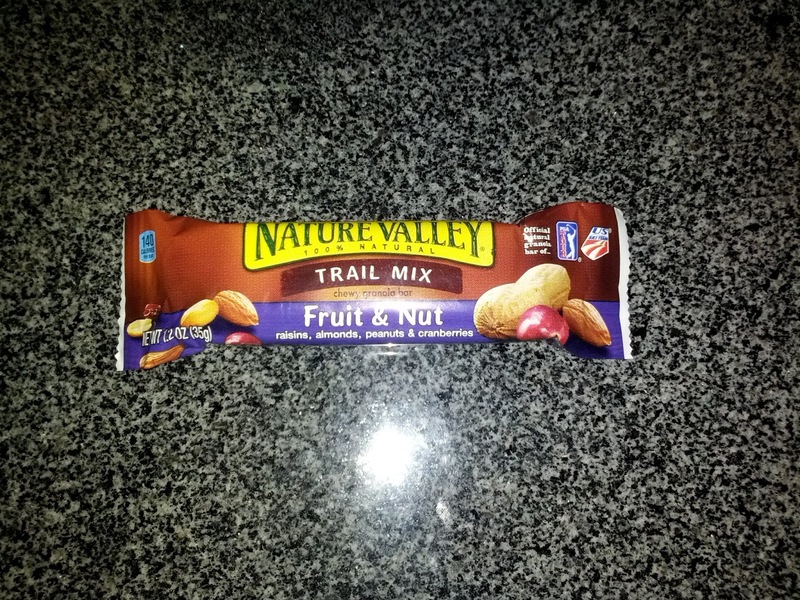 The "Trail Mix" line is chewy style, loaded with different fruits and nuts. The classic is the "fruit & nut", but they also have a more specialized Cranberry & Pomegranate and Dark Chocolate Cherry bars. Fruit and Nut Chewy Trail Mix Bar. "Three different kinds of nuts and seeds with dried cranberries and raisins" ... or so says the description. The ingredients label however lists only two types of nuts (peanuts, almonds), not three. And no seeds. But yes, there were dried cranberries and raisins, in addition to the oat base. It was very sweet, with lots of sugar syrup binding together the already sweet raisins and dried cranberries. The only other filler was the oats. Not really my thing. The protein bars are classic chewy style, loaded with nuts and rice crips, plus extra protein hidden inside via my "favorite" form, soy protein isolate - yum! They do all have tasty looking coatings. Flavors range from coconut almond bars with a coconut flavored coating, salted caramel nut, peanut almond or peanut butter, both with chocolate chips and dark chocolate coating, and mixed berry with Greek yogurt coating. They boast about 10 grams of protein each. Peanut Butter Dark Chocolate Protein Bar. "A tempting combination of roasted peanuts and luscious peanut butter, all flavored with rich dark chocolate". They need to work on their description ... "flavored with rich dark chocolate"? Is that supposed to sound appealing? Anyway. This did look pretty good, puffed rice, whole roasted peanuts, mini chocolate chips, and, although you can see it in the picture, the bottom was all coated in chocolate too. Even though there were peanuts, I didn't taste any of the namesake peanut butter, or even just peanuts really. The overwhelming flavor was that strange funk of soy protein isolate and whey protein, the magic ingredients turning this granola bar into a protein powerhouse with 10 grams of protein. I didn't like this, and wouldn't get again. Even the greatness of chocolate and peanut butter couldn't overcome the strange protein bits, unlike the actually really tasty Peanut Butter Whey Protein Fit Crunch Bar I reviewed last week. "Delicate squares of granola with a unique, delightfully crispy texture. Each thin is paired with a delicious melt-in-your-mouth dark chocolate flavor." 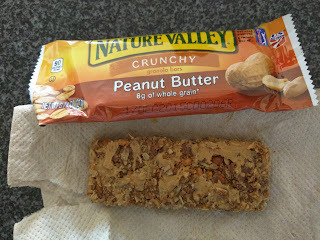 This was a very thin, very crisp granola bar with good peanut butter flavor flavor. The chocolate layer on the bottom was decent dark chocolate. Overall, pretty good, particularly for a crunchy style bar, which I don't normally love. 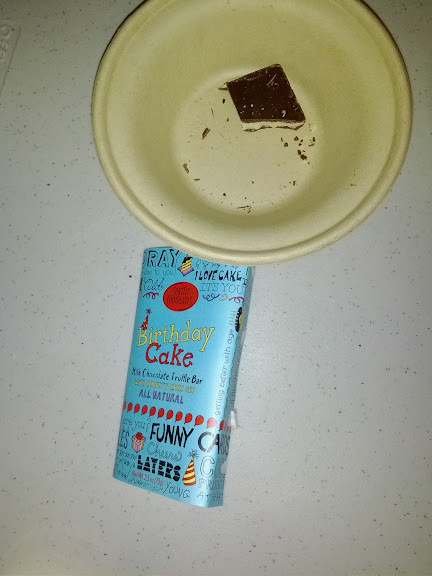 The chocolate and peanut butter combination was a winner, and the ratio of bar to chocolate was just right. Crunchy bars are available in a slew of flavors, ranging from the basic Oats 'n Honey to nutty (peanut butter, roasted almond, pecan) to fruity (apple crisp, coconut) to fall inspired (cinnamon, maple brown sugar). They aren't joking when they call these "crunchy", certainly the crispiest bars I've ever found on the market. "Nature Valley® Peanut Butter Crunchy Granola Bars combine whole grain rolled oats, crisp rice, and peanut butter to produce a sweet and wholesome snack." This was crazy crisp. I know they are called "crunchy", but I wasn't quite expecting it to be soooo crispy. Like the granola thin, it had a really nice peanut butter flavor. Better than most granola bars I've had lately, which makes me think that perhaps I like the crunchy ones more then chewy ones? "Nature Valley® Oats `n Honey Granola Bars combine real honey and rolled oats, to produce a sweet, wholesome snack." 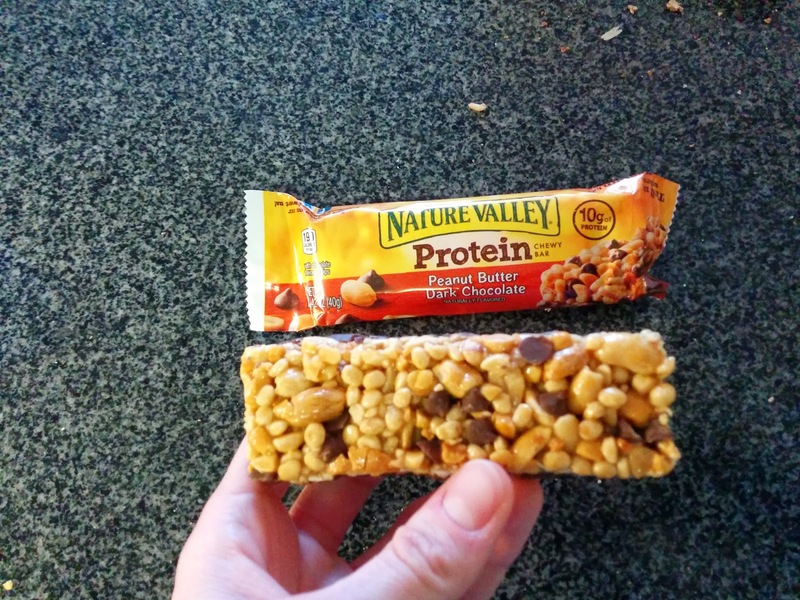 Meh, this was just a hard plain granola bar with a tiny amount of honey flavor. It was kinda stale tasting because it was so crunchy and there was no other flavor besides the subtle honey. Certainly not for me. Welcome to another installment of Julie-visits-a-random-place-because-of-Paypal-promotion. I've had my eye on Onigilly for ages. They pop up at different markets with their food cart, they've had a main location on Keary for a while now (although, only open M-F, making it less useful for me), and recently opened an Embarcadero location. But I still hadn't managed to stop in before. One weekday afternoon, I did manage to find myself near their Kearny St. store, so I finally visited. I was really interested to try their amazake, described as a hot horchata, given that I like horchata, and it was very cold outside. Unfortunately, they were out of it when I arrived at 1pm. I guess I wasn't the only San Franciscan absolutely freezing in the 45 degree weather. Then, I was interested in a seasonal special listed, a squash salad. I asked what was in it. The person taking my order didn't know. He didn't offer to ask. I tried to get any details, like, was it a salad of salad greens just topped with squash? Or squash cubes in some sort of dressing? Nothing. Besides the unhelpful person taking my order, service was really friendly. Each time, when my food was ready, they called me by name, and thanked me for ordering. The store is small, with a few tables, but most people seem to grab and go. I've stopped in several times to try assorted onigilly and sides, although I haven't really loved anything. I'm still very curious about the amazake, but it is now it is no longer on the menu. On my first visit, I just went for my first onigilly. It was ok, but not really my thing. 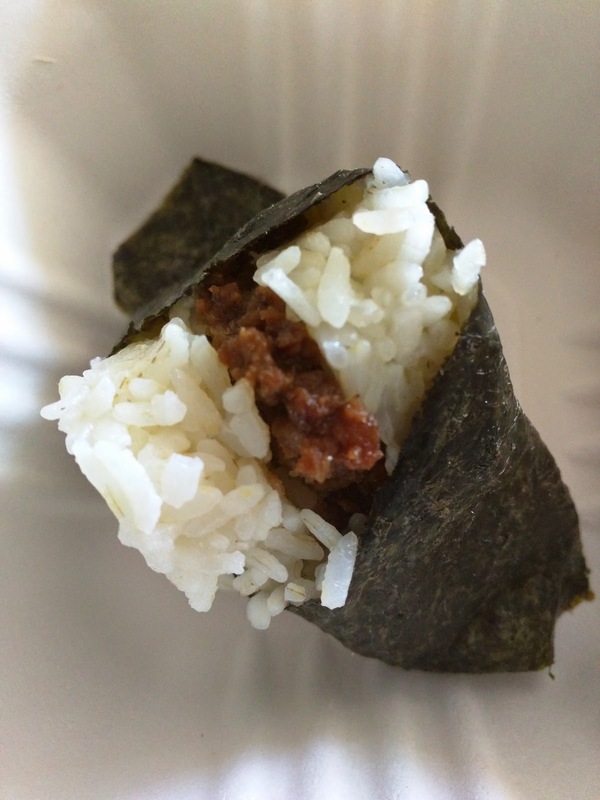 I had never had onigilly before, but it is basically just sushi in a slightly different style. Their signage tells me that it is more common than sushi in Japan, due to its convenient form, good as street food. Generally made with fillings similar to what you'd have for sushi, although less perishable, with rice, wrapped in seaweed. Onigilly offers onigilly in a slew of varieties, mostly seafood (shrimp, cooked albacore, crab, salmon, eel, roe, etc) or vegetarian (tofu, ume, natto, shitake, lotus, etc), although they also have a few meat options (beef, chicken, bacon). All wrapped up in seaweed, and surrounded by organic brown rice. A month or so after my first experience at Onigilly, I went to Tokyo, and discovered that they really are everywhere. Even the airline lounge in SFO had them, as did every corner store, including 7-Eleven. They were served for breakfast at my hotel. And as snacks in my office. You could find them pre-made absolutely everywhere (although, made with white rice, and presumably not organic). And in Tokyo, I really liked them. So, when I got back to San Francisco and was craving one again, I went back to Onigilly, even though I didn't really like the first one I had. I again didn't like it, but I realized why: they use nice organic brown rice. It was the sweetened, glumpy, white rice that I really liked in Tokyo. The fillings are quite tasty though! "Canadian snow crab w/ lemon aioli. " The choices for onigilly were numerous, but I was craving crab. Even though this was snow crab, not local Dungeness, I still went for it. I don't really like rice, and usually prefer sashimi at sushi restaurants, and I knew this would have even more rice than nigiri, or sushi rolls, but ... I was here to try something new. The rice was warm, hearty brown rice. They use only brown rice, California grown. It was fine, but, well, there was a lot of rice. Inside the rice was the snow crab, a good amount, shredded. I guess there was lemon aioli in there too, but I didn't taste lemon, nor really pick up on any creamy aioli. At least it wasn't over mayo-y. I did really like the nori wrapper. It was crispy and held up well. I see the appeal of onigilly. It is easier to eat than sushi. If I liked rice, I could see myself enjoying it. But as it was, I really just wanted the crab out of the center. $3.22 for a single one was fine for a snack, and they also offer platters with multiples and sides such as miso soup or edamame. I also tried a few other seafood onigilly, such as the Miso Tuna Salad, "Cooked wild Albacore with miso aioli", which was basically the same, except with what seemed like generic canned tuna in the center rather than crab. I think both Ojan and I were a bit shocked with the tuna, although, it wasn't advertised as anything different. I didn't taste the miso, and it was kinda strange to just have tuna salad inside some rice. Hijiki. $2.76. Pickled Diakon. $0.46. "Braised hijiki seaweed, carrot, tofu & edamame." On my next visit, I went vegetarian, for the hijiki. 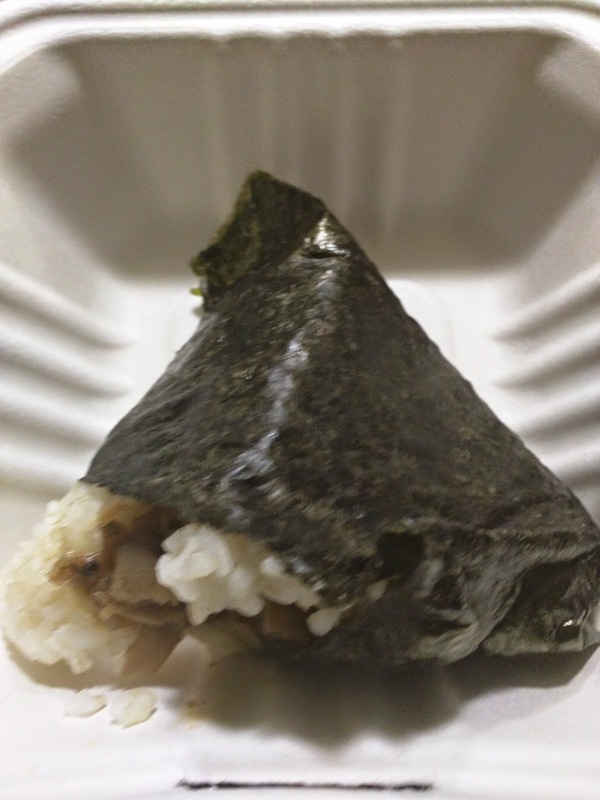 Again, nice crispy nori wrapper, warm brown rice. The form changed this time however, it was served as a triangle shape, like all the ones I saw in Tokyo, rather than the more handroll style I had the first time. I again just wasn't into the rice, but the filling was tasty and plentiful. The seaweed had a lot of flavor infused in it, and I liked how crunchy it all was. But, I'd still just prefer a side of hijiki salad, rather than an onigilly. I also ordered a side of pickled diakon when I saw it on the menu. I LOVE pickled diakon, and this was no exception. Crunchy. I loved it, and wish I'd made a double order! The price for the single onigilly was great, only $2.76 since this was a vegetarian one. And diakon was another $0.46, making my entire little snack just over $3, a wonderful deal. "Spicy sautéed lotus root w/ sesame". The wrapping job on this one was quite poor. Totally falling apart. But what lie inside was tasty enough. I liked how crispy the lotus root was, and the sesame added a lot of flavor. And ... it was spicy! I was just trying a bite of the filling out of curiosity, this was for Ojan, so I didn't have the rice to balance out the spice, and it had quite a kick. Again, if I actually like riced balls, I'd like this one. "Bacon cooked w/ garlic butter & chili." Ojan picked this up one day and told me I needed to try a bite. It was certainly the most interesting of all the ones I tried. It really was spicy. It tasted a bit like crumbled sausage. Really not bad at all, but I still don't like rice! Ok, this was delicious. If only I liked the rice. It tasted more like sausage than beef to me, but the flavor was great. I'm glad Ojan let me steal a bite! 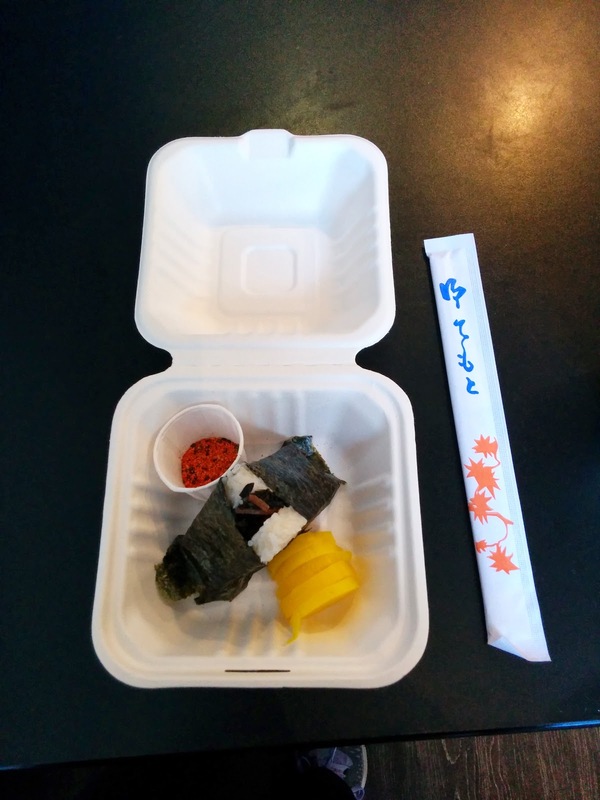 Besides the onigilly, the menu is fairly limited to just a couple soups, edamame, and tamago. I of course tried a few of these too. I'm not really a soup fan in general, but I was a bit chilly, and wanted something warm and comforting. So I got the miso soup. I expected just a broth, maybe with a few bits of token seaweed or tofu in it. Instead, this was fairly loaded. 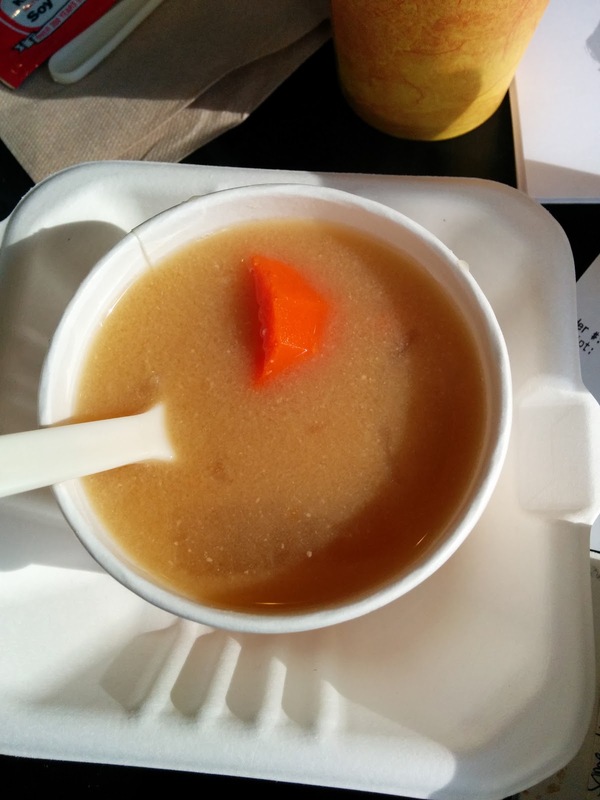 Along with plentiful tofu and seaweed, there were large chunks of carrots, onions, and daikon. The veggies were all a bit too soft for my liking, and the soup overall wasn't all that interesting, but it was a very impressive serving for the very reasonable $1.95 price tag. It was also served piping hot. I love tamago. I know it sounds crazy, but it is often one of my favorite pieces of nigiri when I go out for sushi. I always terminate a sushi meal with it, and judge a restaurant by the quality of their tamago. So I was pretty excited to see it on the menu. The tamago was served just as slices, no rice. This was fine with me. But ... it wasn't really tamago. It was just an omelet. As you can see, there were no layers. It wasn't seared on the outside. 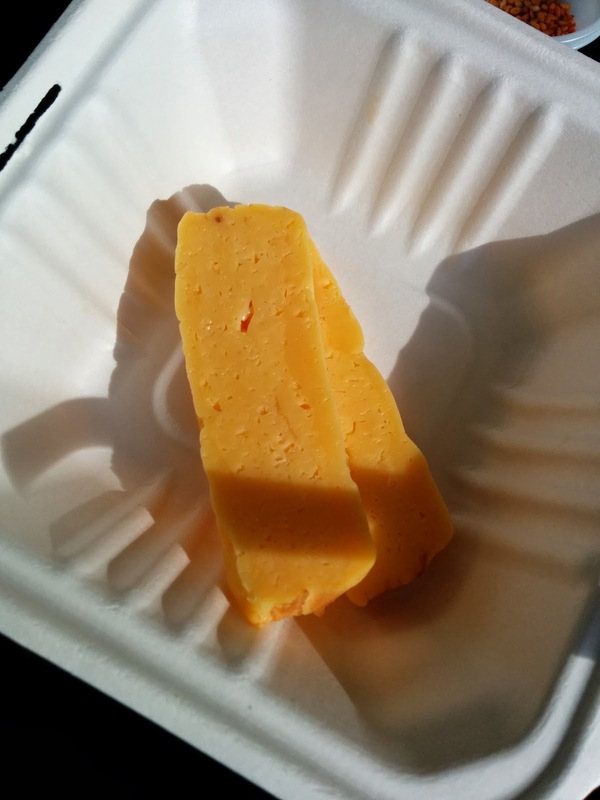 Maybe it had a mild sweetness, but there wasn't much depth of flavor. Really, it was just egg. 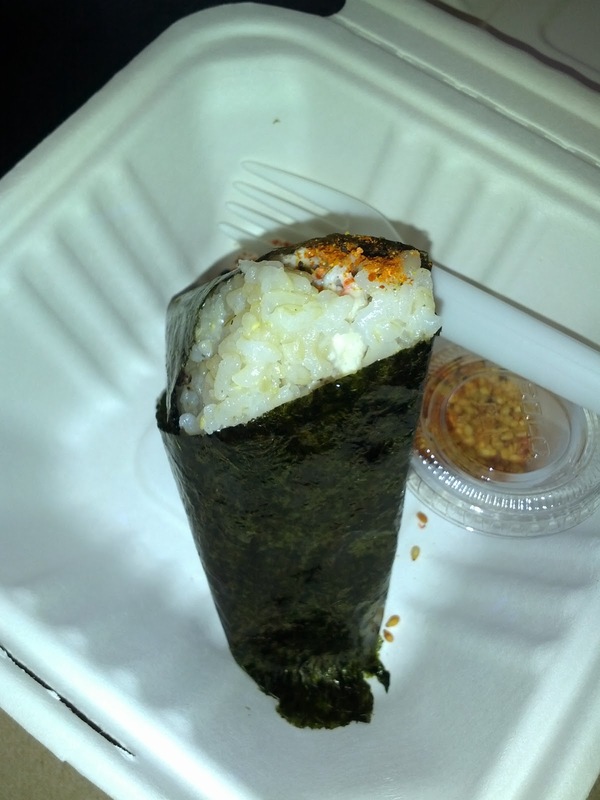 It wasn't bad, but it certainly wasn't what I'd think of as tamago, and I wouldn't get another. $1.95 for two pieces was a fine price. 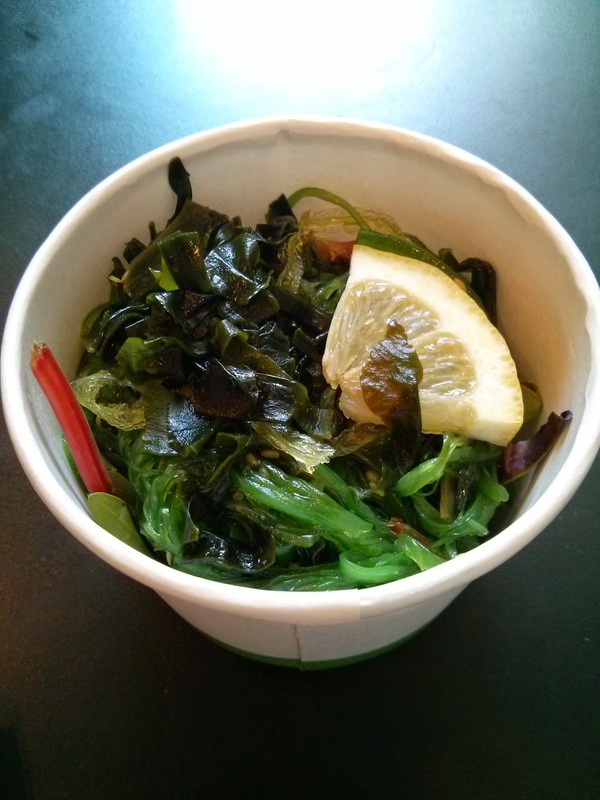 "Sesame seasoned wakame seaweed on top of our mixed green salad". The seaweed aspect of this was was pretty standard, a mix of several different seaweeds, fairly fresh tasting, a bit of sesame and dressing. I appreciated the lemon wedge too. But ... it was served on top of mixed greens? That was really strange to me. Overall, fine, not particularly good nor bad, a decent portion for $1.84, but I didn't particularly want more. Very recently, they added desserts to the menu. Or ok, a single dessert. Since I have a serious sweet tooth, I couldn't resist. At the register, in full display when you order is the offering: strawberry mochi: "House Mochi with Fresh Strawberries, Rice Flour, Red Bean Paste". It came in a inverted cup. Inside was a large strawberry, fairly ripe, but still a bit white on one end. 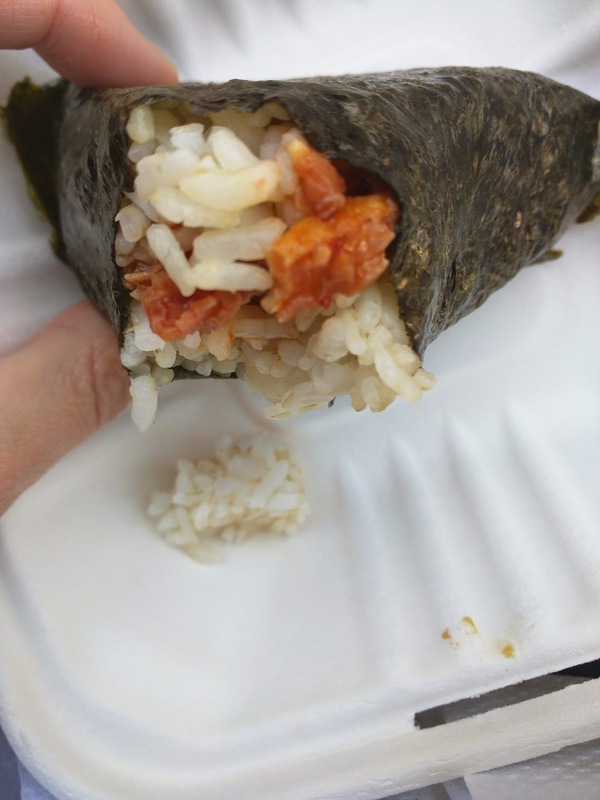 It was coated in a thin layer of red bean paste, that didn't seem particularly sweetened, and a thin layer of very soft mochi, dusted with flour. It was all ... fine. 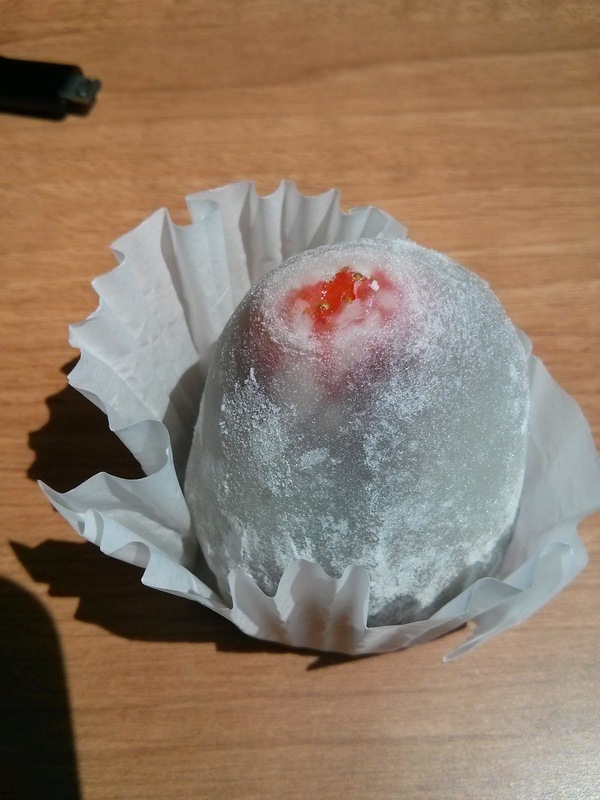 I like mochi, I like red bean, I like strawberries, but this didn't quite come together for me. I wouldn't really want another. 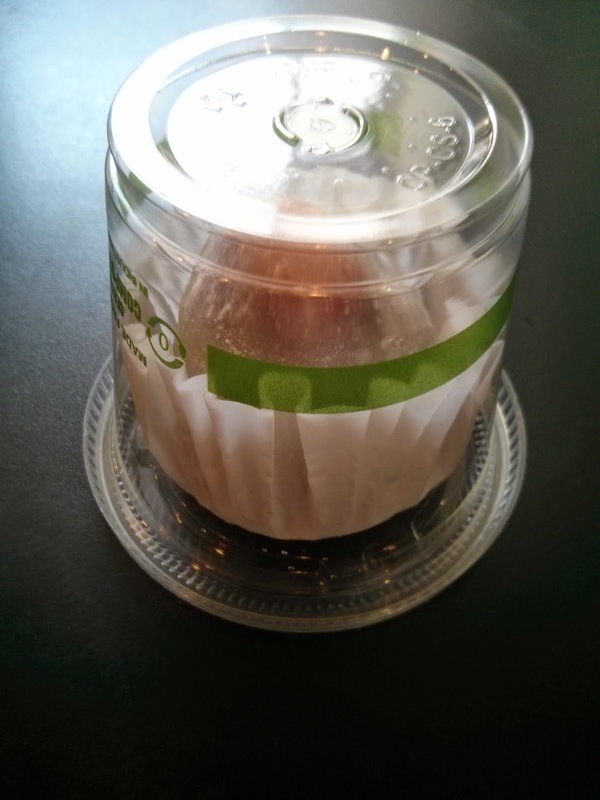 $2.76 is cheap for a dessert, but for just a single mochi strawberry, it actually seemed a bit high. 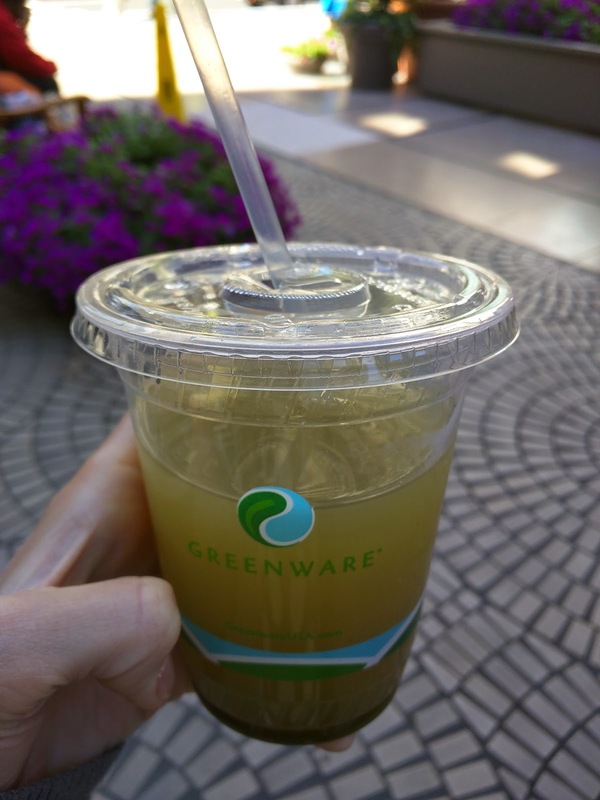 Matcha Green Tea Lemonade. $2. What do you do on a hot day? You order refreshing lemonade! I've had plenty of ice tea + lemonade combos before, but never with green tea. It was lighter, and more refreshing this way. However, it was too sweet for my taste. I needed to dilute it to make it drinkable, and then I quite liked it. I probably wouldn't get another though, but it helped quench my thirst on a hot day! If you've read my blog for a while, you know that a few years ago I was on a mandatory liquids only diet for a while. 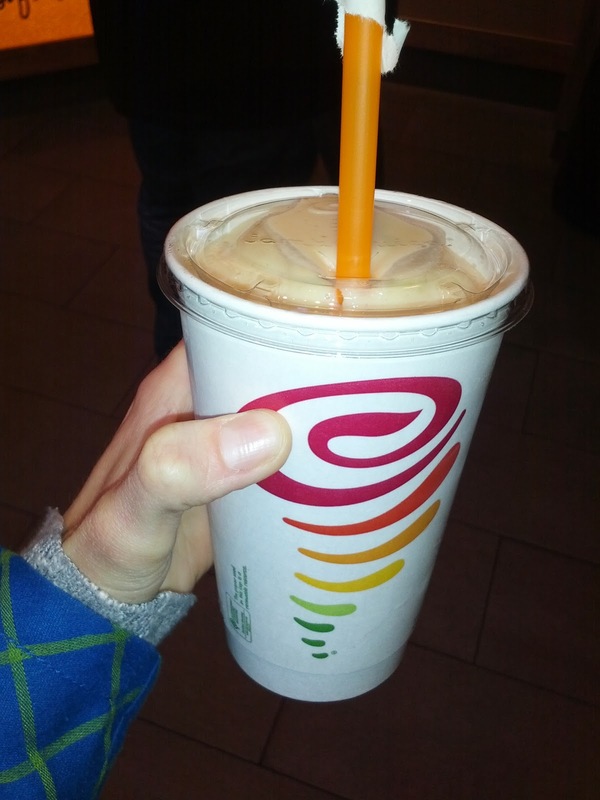 During that time, I had far more than my share of smoothies, many from Jamba Juice. So I've reviewed it before. Once I could eat regular food again, I did not return. But, after several years of eating regular food, I finally did, mostly to check out some of the newer offerings (like fresh squeeze juices) and the elusive Matcha Green Tea Blast. I'm still just not really into this place. I don't understand why anyone would choose to Jamba beverage over something else. Maybe I'm just scared from far too many smoothies. The last time I reviewed Jamba Juice, you may recall that I really wanted the matcha green tea smoothie, but it had been discontinued. Well, it came back, so I got to try it. It is made with soymilk, nonfat frozen yogurt, plain sorbet, and of course, the matcha green tea. I was so eager to try it, but ... I didn't like it, at all. It was very icy, not at all creamy. Even as it melted, it never went through a phase of being a consistency I liked. It did have a slight matcha taste, but overall, this was not good at all. Sadness, after all that anticipation! This was fresh squeezed. Decent orange juice. But still ... just orange juice. $4.89 seemed very expensive for a glass of juice! And, another fresh squeeze juice. The fresh squeezed part was legit, I watched her put whole carrots into the juicer, and produce my juice. It tasted like ... carrots. I've had a fair amount of carrot juice recently, and this somehow tasted less sweet. I wonder if they use a different kind of carrot? I actually prefer it a bit sweeter. 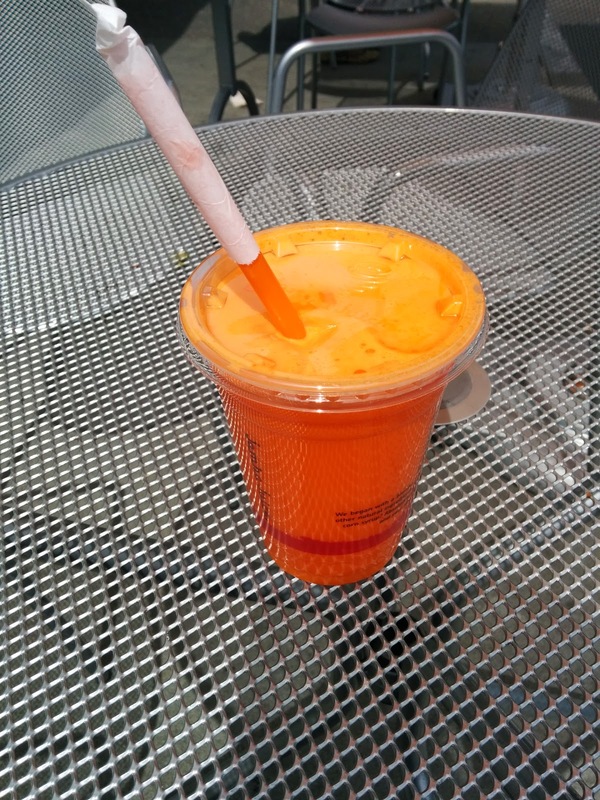 But yes, fresh juiced, nice and frothy on top, but again $4.89 felt pricey for a juice. Peach Pleasure Make-It-Light, Small. $4.49. Made with peaches, bananas, orange juice, dairy base. Apparently the peach idea has appealed to me before, as I found my notes that I'd gotten this, although not the light version, twice before. Once I thought it was too sweet, once I thought it was ok. This one, I really didn't like. It tasted way too banana-y. And, I didn't realize it had dairy in it, so I was confused by the sorta yogurty taste, although that part makes sense now. It wasn't refreshing, it wasn't tasty, and I certainly don't want another. Continuing on the theme of chocolate from Seattle, like Theo Chocolates, I present the aptly named Seattle Chocolates. A visiting co-worker from Seattle brought a couple of their very interesting bars for me to try! This was really interesting! I generally avoid white “chocolate” as it tends to just be sweet overkill and uninteresting, but this was actually quite nice. The bar had little chunks of lemon candy inside that added a very intense lemon flavor and crunch and the white chocolate was not overly sweet. Far exceeded expectations! Hmm. This bar was kinda crazy looking on the inside, as it was all different colors. I couldn’t really pinpoint what the filling was though, I wouldn’t have guessed birthday cake, it was sorta just a sweet white chocolate like truffle center surrounded by mediocre milk chocolate. Not my thing, but certainly interesting to look at! As I opened the wrapper, my first thought was, "wow, this does sorta resemble a margarita! ", based on the aroma alone. That thought continued as I bit in. Yes, they did really channel a margarita on this one! 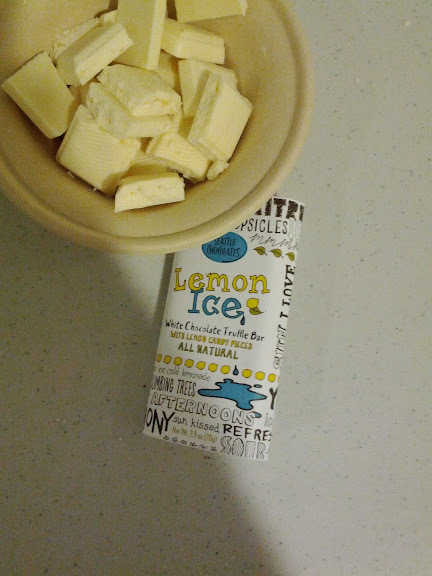 The salt coating and the lime flavor were both good, and fun flavors to have with chocolate, but the white chocolate itself had a bit of funk to it. 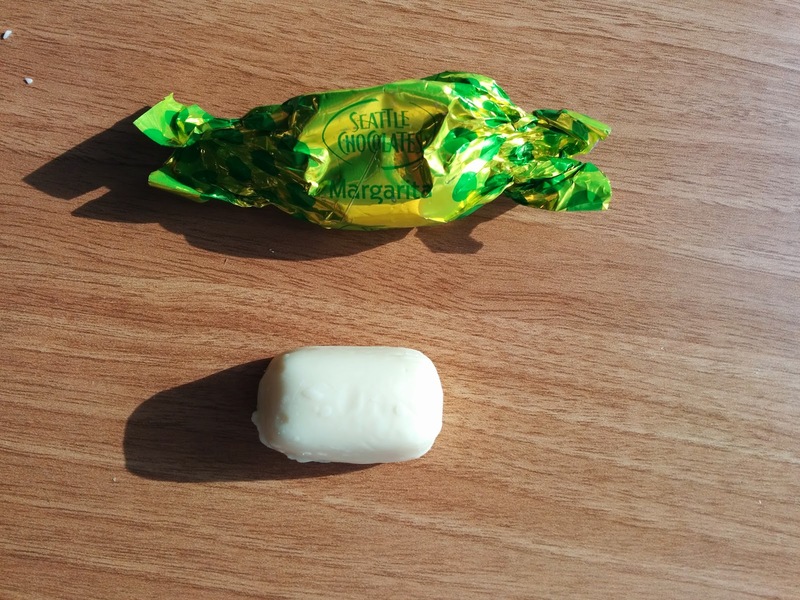 I did like the white chocolate in the lemon ice truffle bar, but here it really reminded me of just standard bad white chocolate.